As President Obama travels to Nevada to speak about immigration reform and a group of senators propose a framework for bi-partisan legislation, a plurality of Americans favor a balanced approach. When asked last June about priorities for dealing with illegal immigration, 42% said they want an approach that balances both tougher enforcement and creating a path to citizenship for the more than 11 million immigrants who are in the country illegally. About a quarter (28%) said tougher border security and stricter law enforcement alone should be the priority; about the same percentage (27%) said developing a way for illegal immigrants to become citizens alone should be the priority. These views had changed little since 2010. 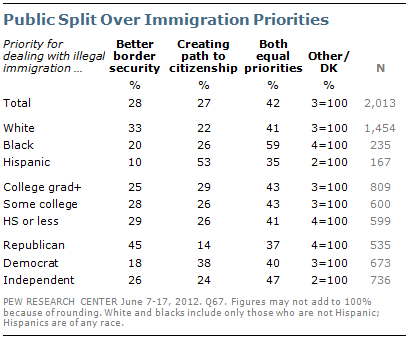 Opinions about priorities for dealing with illegal immigration were divided along ethnic and racial lines. Just more than half of Hispanics (53%) said that creating a path to citizenship should be the priority for dealing with illegal immigration; another 35% said the priority should be a path to citizenship, along with better border security and stepped up enforcement of immigration laws.